If you’re going to host a web site or application, and you hope that the traffic will come, the last thing you want is a vendor that can’t scale. That’s why companies choose PracticalHost Cloud Hosting – because we’re a partner you can trust. When you host your sites and applications with our Cloud Hosting, you can stop worrying about scaling the infrastructure to match your traffic. Everything you need to scale is all baked right into the platform and works automatically. You’ll never have to worry about your hosting infrastructure again. We take care of load balancing and monitoring to make sure that whether you have 1 visitor or 1 million visitors, your site won’t struggle. 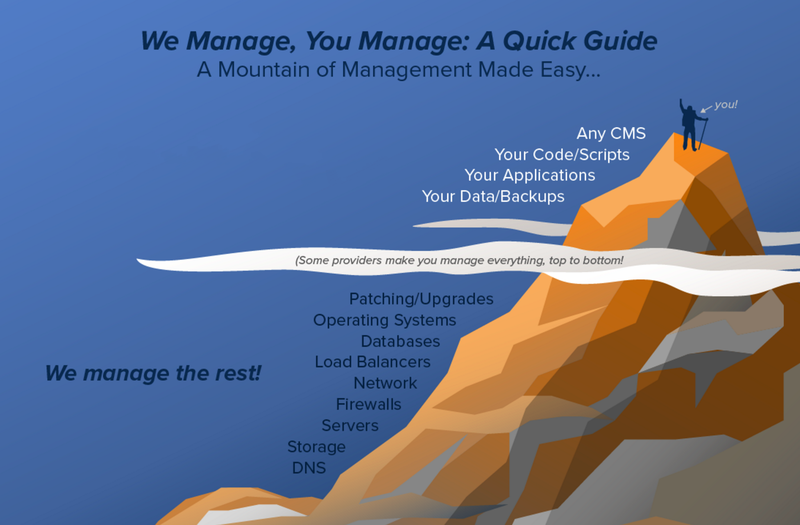 Managed Infrastructure & Services – never worry about OS or framework updates again! 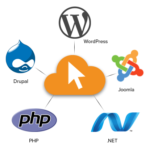 Cloud Hosting supports the most common content management solutions for your website, like WordPress, Joomla & Drupal. We also support applications like MediaWiki, phpBB and more! Or, do you fancy the road less traveled? Well we can accomadate you too! You can also run your own applications running on PHP, Laravel, or .NET! No more traffic spikes and infrastructure headaches. Our cloud-based web hosting will ensure your sites stay up and running. Our experienced customer support is available to help 24/7, all year long. We guarantee rapid solutions and tailored care, no matter how much your needs change. Other than a 99.9% guaranteed uptime since your website will be load balanced on many servers, a cloud hosting scales to handle traffic spikes. If your website suddenly gets a surge of thousands of visitors, our hosting platform will be able to handle the load. What if I need more than 5GB disk space and/or 25GB of traffic? You can purchase as many 5GB disk space /25GB traffic additions to your account for a yearly fee of $120. MySQL is free. MS SQL is optional at $120 per 100MB. Can you pre-install a CMS? Upon ordering, you can specify if you would like us to install for you WordPress, Drupal or Joomla to save you time. What do I, as a client, have to manage? You are responsible for your code, scripts, applications, data and website security. What is PracticalHost responsible for? We take care of server patching and upgrades, DNS, firewalls, load balancers, storage, databases, servers and the network to make sure that your website is always up and running.